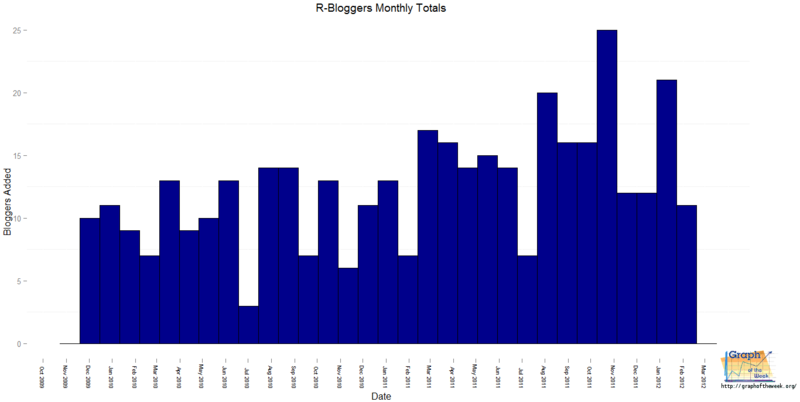 Number of blogs aggregated into the R-Bloggers news site. R-Bloggers is a website devoted to news and tutorials related to the R programming language. The content is generated by a growing number of R statisticians (as reflected in the chart above), providing a wealth of information. The site itself is aesthetically pleasing, showing the header of each article. It's based on RSS, so once your site has been approved and linked, any new articles are automatically loaded onto the site. This provides important exposure for the original author of the work as well as a valuable back link to their blog. Unlike other news aggregation sites (which work by submitting links, not by automatically feeding RSS), you aren't penalized for promoting your own site. This is especially important for authors wanting to contribute something meaningful to the world. For those visiting the site mining for information, R-Bloggers provides full search capability as well as a listing of the contributing blogs should a user want to visit them directly. 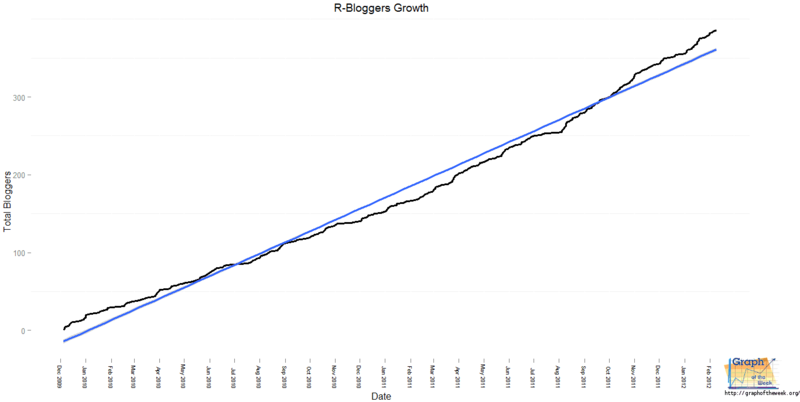 Looking at the graph, you can see that the site has had a stable supply of R-related blogs coming in each month, with a steady linear trend upwards as the years progress. A cap exists out there somewhere, as there are a finite number of R blogs out in the wild, but that number appears to be unknown. For now, the site continues to grow and provide a valuable service to the R community. 1) How many R bloggers are still out there not yet feeding into this site? 2) Will development on the R platform continue? 3) Are there other blog aggregator sites like this one for other niches? Nice plot. It would be interesting also to plot the number of blogs added per month, which ought to make a nice flat line, but where the dips and humps might be magnified. It's also a sad fact that many people take up blogging the way they take up diaries-- the best intentions may result in only one or two entries. With a sufficient number of drop-outs and new blogs, there might _not_ be an and to this linear trend in sight. As a corrective, (if the metrics are available) you might also plot the number of stories published per month. My hypothesis would be a much smaller increase than that displayed here. In fact, that was the first graph produced, but it didn't show total growth, so I opted for the one you see in the article. It would indeed be interesting to see the 'drop out' rate as you suggested via articles published per month - that would be a great way to see who is still active and reflect the true 'currently active' community.